IMPORTANT: This content is deprecated. Please visit the new CYCLELICIOUS 2.0. Police say citizen found the bike. 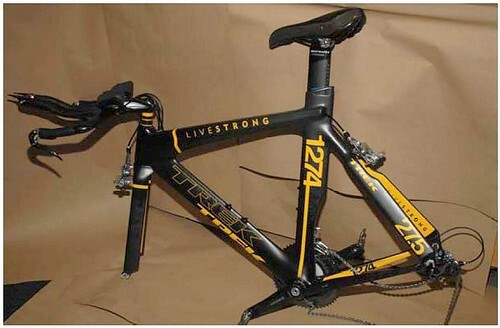 Last Saturday night, Lance Armstrong's custom time trial bike was stolen along with two other bikes when thieves broke into a Team Astana truck parked in an alley. Initial reports said four bikes were stolen, but one of them (Jani's) turned up in a hotel storage room Tuesday from what hotel staff said was from miscommunication between Astana and the hotel. According to Sacramento police, a a local resident, who wishes to remain anonymous, drove to the police station and turned in a bicycle he believed was stolen from Lance Armstrong. The person is not a suspect and the police are not releasing details of how he came across the bike pending their investigation. The bicycle is currently in the care of the Police Department and arrangements will be made to return the bicycle to the owner, hopefully in time for the Solvang time trial. I first saw this at Twitter/BizAvWeekly. You can find me here at Twitter. Are you Cyclelicious? IMPORTANT: Please post comments for this article at the new CYCLELICIOUS 2.0 version of this page. Her name is Detective Stella Bonasera, and she's single. let us hope that is fact, not just fiction, what of the others that were stolen from the trailer? Sacto police confirmed to me the bike has been recovered, but didn't provide any other information yet but it's on the way. Updates posted: anonymous citizen returned the bike, cops investigating how this person got the bike. I wonder if there was a reward for it? I would personally would like to ride with Astana for a few miles. Looks like the seat and wheels were jacked. Also, why did TwitPic remove yet another photo? Good to see they found it. My brother is a believer that Trek setup this to get free advertisement. I told my brother Twitter received more attention in mainstream media over this than Trek. I heard some stat that LA's twitter account has received over a 2000 new followers each day after he announced the bike was gone via Twitter. Just maybe someone at Twitter stole the bike! Excellent. Te credits of this investigation certainly aren't complete though. The lead detective was French Inspector Clouseau. His team actually found the stolen bike.Look here. Ah, my factual mistypes continue. Ron Callahan's a different biking Ron that I know. So never mind. But don't feel too bad, Ron. An amazingly gorgeous beautiful woman came up to me the other day, gave me an enthusiastic hug and told me she was so glad to see me. And I didn't recognize her at all. And it showed. "I'm Cynthia. You know, from the film commission." "Oh yeah, CYNTHIA! So Great to see you again!" It's hard work following these professional cyclists, y'know. So all you have to do to recover a stolen bike is to win the tour du france seven times. Great for Lance, now if only we could motivate the rest of the police in this country. Anon 5:20 -- you're so right :-/ Though in this case it wasn't police work, but the anonymous citizen who turned the bike into police. whoa. Detective Bonasera of the Sacto PD is HOT. that is my takeaway from this posting. if anyone else lost a bike the police would laugh. lance has so much money go buy another one or better yet get one for free from his sponsers.